views of Windsor Castle in the distance. This Hilton is new from the ground up. It makes arriving and leaving from from the rather dysfunctional LHR Terminal 5 more than just a rest stop but actually a real pleasure. (Its name is a bit misleading. It is near but not right by Terminal 5. You have to take a Hoppa Shuttle to get to it.) It is modern, upmarket, light and airy, and beautifully equipped 24-hour Fitness Centre and with a luxury on-site spa that offers many beauty treatments as well as massage. Not to mention the professional but relaxed staff who welcome you with a warm "hello" and go out of their way to help weary travelers with any little problem. The pool is indoors so weather is not an issue. All of the 350 rooms and suites are pleasant, spacious and the windows are totally sound proofed so you would never know you are on one of the flight paths for the airport. No landings or takeoffs to keep you from you rest. We found the Executive rooms to be especially nice and loved the large glass-enclosed showers in the softly lit bathroom. But a bath was included as well and the layout, while designer modern, was also functional and well equipped. The Executive Lounge was especially well equipped and thoughtfully so. They supplied one of the best breakfast buffets we have encountered and they even bake their own breads! The "tea time" buffet was enough for a light dinner and Peter especially enjoyed the espresso machine. 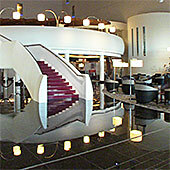 Two restaurants are available, both up on the mezzanine. One is a pan-Indian cuisine, artfully prepared by Chef Cyrus Todiwala whose creative dishes were acclaimed at his London "Cafe Spice Namaste". The "Gallery Restaurant" with its open-plan kitchen offering both traditional and modern British specialties, places an emphasis on fresh, seasonal produce and products. There is also "Musette's Coffee Shop" in the main lounge offering latte's, espressos, teas and freshly made sandwiches and panini s. A nice selection of 4 pastries, cakes and muffins look quite tempting as well. 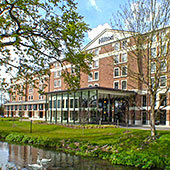 The Hilton at Terminal 5 not only offers light and pleasant rooms and baths but is proximity to Windsor Castle and the Windsor Legoland Theme Park makes it an ideal hotel for a holiday in this historic and lovely part of England. Ascot race course is also nearby. 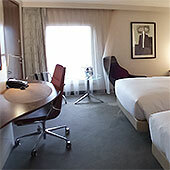 Accessible Rooms: Feel at home in a spacious Accessible Guest Room at the Hilton London Heathrow Airport Terminal 5 hotel. Refresh in the stylish wet room bathroom which features an accessible shower and grab rails, stay connected with wireless internet access and watch a movie on the 37-inch LCD TV. Internet contact is a form on their website.